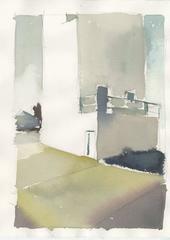 VFD #5 is an industrial watercolor painting on paper by California artist, Ferdinanda Florence. It is 11x7.5, unframed. It is based on the building in Vallejo California where the fire department conducts training. Ferdinanda Florence was born in Washington, DC, and grew up in Arlington, VA. She received a degree in art history and studio art at The American University in 1994, and has continued to pursue a successful professional life as a scholar, teacher, and practicing artist. She earned her Master’s degree in art history at the University of Maryland, College Park, in 1998. A second-generation Armenian-America, Ferdinanda has explored in her research the role of place in artistic expression. Her Master’s thesis detailed the link between Armenian religious rituals and church architecture. In her travel to sites in France, Italy, and Germany, she has researched the symbolism of doorway and floor decoration in Romanesque buildings. In her artwork, she uses industrial sites in her home city of Vallejo to explore issues of place on a more personal level. Ferdinanda’s exhibitions reflect her varied interests and concerns. Her work has appeared at the Di Rosa Preserve, Napa (“All in the Family IV,” 2005); the University of San Francisco Law School (“Creative Justice: A Social Art Exhibit,” 2005); and as set decoration for a Bay Area Playwrights Festival performance at the Magic Theater, San Francisco (“As American As,” 2006). Her drawings were selected for exhibition at the FATE Biennial Conference at the Savannah College of Art and Design in April, 2013. Watercolor on paper, signed and dated "Steven Robert Kozar 1988" to bottom right corner, linen mat under plexiglass with silvered wood frame, overall 54 ⅛" x 25 ⅜".